Chela: Is a pincer-like organ that is located in the end of certain limbs on some arthropods, also known as their claw. Be careful as some creatures have a strong pinch that will hurt you! In Arizona, we, Varsity Termite and Pest Control, are dedicated on getting rid of any kind of pest that can bother you in your home, don’t hesitate to contact us for any inquiry. Chelicerae: This is another term for the mouthparts; their shape varies from each kind of arthropod such as arachnids, crabs, scorpions and sea spiders. Some species also use it to inject venom. Eurypterid: An extinct group of arthropods informally called “sea scorpions”. It is proved that the earliest ones were marine, but not true scorpions. Their spiked tail, also known as telson, may have been used to inject venom, although there is no evidence that they were venomous in the first place. It´s kind of scary to know you can find these kind of creatures in deep water. Lateral Eyes: As the name explains, this is the name of the eyes that are on the front edge of the insect’s carapace. Scorpions can have up to 5 eyes but they usually come in pairs. This type of eyes can also be called lateral compound eyes, which are used to detect edges and are capable of forming images. Medial Eyes: This is the pair of eyes found on the dorsal part of the carapace, also called smaller medial ocelli, which are simple eyes. These are used to detect lower level lights, and have a faster response time. Mesosoma: It’s the middle part of the body which is composed of six segments in scorpions, and contains all major organs forming the first part of their abdomen. You can find their sexual organs and a pair of appendages, forming a structure called the genital operculum, in the first segment. The second segment have a pair of sensory organs called the pectines; the last four segments contains one book lung each, making a total of four. Metasoma: As the posterior part of the body, it contains the digestive tract, respiratory system, and a circulatory system. In scorpions, this is their tail, which they use for their powerful sting. Some species are poisonous to the human, so we suggest you to seek treatment as soon as you feel a bad symptom after a scorpion encounter. Obligate Burrower: This refers to the scorpion species that prefer to dig its own burrow. They require a deep space underground and will tunnel vertically for a long distance until they have a comfortable space to live in. These are the kind of species you can find outside your home, for example, in your garden. 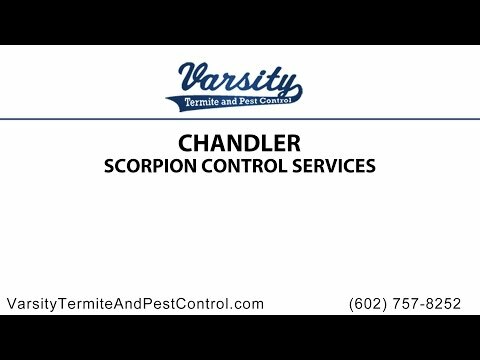 If you ever find scorpions in your garden, you can contact us, Varsity Termite and Pest Control, to do and inspection and evaluate what kind of scorpion control in Chandler you need. Opportunistic Burrower: This type of scorpions doesn’t like to do their own work, so they just use another started burrow and expand their territory on it. Opisthosoma: This is the posterior part of the body in some insects, right behind their cephalothorax. It’s mostly a distinctive feature on arachnids, horseshoe crabs and other animals. Parthenogenesis: It´s another way of saying asexual reproduction, which means that growth and development of embryos can be made without fertilization. Believe or not, scorpions are capable of reproducing like this, and it’s why that whenever you find them inside your hose, you might already be dealing with a pest. Don’t hesitate to contact us if you need assistance or want to know more information about our scorpion home sealing service. Pectine: It´s a comb-like structure, shaped like a “V” and found on the underside of the scorpions, used for sensory adaptations as it’s the most sensitive part that they have. Stridulation: Mostly associated with insects, this is the act of making sound by rubbing together certain body parts. Also, other animals are capable of this, like fishes, snakes, and spiders. In insects it is also referred to as stridulatory organs, particularly known in crickets and grasshoppers. Don’t forget to reach us in Arizona if you ever have any questions about any kind of pest control in Chandler, including scorpions, that annoy your family! Varsity Termite and Pest Control is always ready to assist you with your pest control needs. Contact us today!